The KTM 495 engine is over-quadratic. That means that the bore is bigger than the stroke. 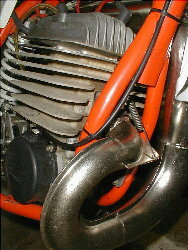 The KTM 495 engine is extreme from this perspective. It has a bore of ø92mm and a stroke of only 74mm. Most modern two stroke MX engines has almost equal bore and stroke. One has found that to be ideal. To fully understand the properties of such an engine one has to return to the physics lessions in school, remember: 1Kg has the energy of 10Newton, to lift 1Kg 1meter you multiply 10N with 1meter to get 10Nm. Shortly The work performed lifting 1Kg 1meter is 10Nm. Now if you lift the thing using a bar or slide it upwards on a batten you don't have to apply the same force but you loose in distance. The conclusion is that energy cannot go away. It can only be transformed. If you are interested in the power developed, for example HP ratings you have to divide the work conducted with the time it took. If you for example managed to lift 100Kg (1000N) 3meters above the ground in two seconds the calculation is 1000N x 3m = 3000Nm. 3000Nm / 2 is 1500W. The Watt rating is normally in seconds. Thus 1500W equals 1.5KW. Now 1KW is 1.365 HP and the other way round too. 1.365 HP * 0.735 is 1KW. How is this related to the 495 engine ? The short stroke means two things. First that the piston is moving relatively slow in meters per second since it travels shorter distance than if the stroke was longer. We'll take that again, the piston is moving slower and travels less distance at a given RPM (Revolution Per Minute) than most engines having the same displacement. The consequence is less moving energy. Kind of less flywheel effect. The other thing is that due to the large bore the channels in the cylinder can be larger (wider) and the piston also has a larger surface to rest on, wall area. Now the larger bore creates a higher piston pressure when the expanding gases burns out. Compare it to a hydraulic piston. A large piston moves a short distance with great force whereas a small piston travels a long distance but doens't have the force. The 495 piston moves a short distance but is pressed down with much greater force. What will happen is that you will get a lively engine that can increase it's revolution per minute during a very short period of time. On the other hand it wouldn't do wery well as engine in a truck since it easily could be overloaded once you apply heavy work on it. The 495 engine doesn't develop extremely high HP ratings but it could climb from a low RMP to high RPM in a extremely short period of time. This means that is should and could out-accelerate almost anything dirtbike alike unless the straightway is very long and uphill. Then the RPM climb is to no use and sheer power is more important. The larger cylinder wall area is mostly a good thing though meaning a possibility to have wider channels allowing more fresh gases to come in and out. It is also better from a wear point of view. On the other hand the higher piston pressure stresses the wrist pin and the crank a bit more. The conclusion is that the larger bore, smaller stroke engine results in: more difficult to start, higher risk of kickback, bad idle properties and difficult to ride smooth when very slippery for example. On the other hand you get high power output, great acceleration and a lively engine. The mass of the huge piston makes up most downsides when it comes to idle and so on. Why is bore and stroke normally equal? This has no theoretic explanation except that we are humans and we consider some engines to be more ridable (having a good powerband) than others. It has to do with the tracks, tires and how fast we can shift comfortably. The practice has shown that the best engines from this point of view is near quadratic (equal bore and stroke). Is the 495 powerband bad? No no, This is a rare bike from the past offering you some extreme properties. It isn't a compromise but mere a heavy weapon if you are up to the task. The powerband isn't all too friendly but then again, an open classer two stroke shouldn't be friendly. It can be described as a bit neurotic. Be a man to stay in command. I believe that it would be very hard to have a new 500-650cc four stroke dirtbike going as fast as a healthy KTM 495 from the early 80's.